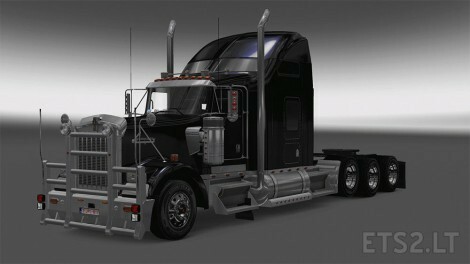 -Add Viking 389 front bumper. -Changed FOV for interior view of 70 to 90. -More weight in the chassis as the original. -transmission Eaton Fuller 18-speed (4:56 Final) + 2 speed (3.90 end +++). Made Custom Cab Marker Beacons. Over 40 Addon Lights Including New Mini Beacon Markers. 20 Bumpers for Truck With tons of Accessory Slots. Added 2 Visors With Custom Light Slots. New Cab Panel With Custom Light Slots. New Tank Lights with Custom Light Slots. Added New Exhaust: Straight Big Pipe and Angled Big Pipe . Added 4 New Tires and Made Custom taller Alcoa Rubber. Added Backside Lights to 2 Cab Variants. Added Custom Light Slots to Mirrors. Added Additional Cab Flares . New Truck Sound and Jake . Changed FOV for interior view. This truck is a work in progress, there are some bugs with model but fully. functioning as of now! i hope you enjoy and give feedback. you need to fix these errors it is not helping in the development of the game. please fix errors. Truck dealer is??? Where is the Kenworth??? 1.23.1s does not work. Some mode is ON. When i goes to DAF dealer, game crash.